vinternals.com was just re-launched today by Stu Radnidge ‏(no stranger to the Virtualization community) but instead of a blog as most have come to know that URL, Stu has created something even cooler in my opinion. If you are familiar with how Y Hacker News, Reddit or even sites like Digg work, Stu is basically doing the same thing but for Virtualization-related topics. It is a news website that is completely driven by the community through the submission of either a link or a question. These entries can then be voted on by the community and the top 100 current entries will be displayed on the home page. I think most will agree that there is already too much information out there today in various forms such as: Blogs, Twitter, Facebook, LinkedIn, Socialcast, Forums, Google+, Email, Distribution Lists, RSS Feeds, etc. and having yet another place to go for information is not going to help. The reason I think this is a pretty neat idea (if successful) for the Virtualization community is that there is a wealth of information out there, why not leverage the community as a whole help surface up useful or interesting content for everyone to benefit? Many times there are useful bits of information or articles that are not shared through the traditional channels or more often not getting enough visibility before it's lost among the cloud of information. Hopefully with a solution like this, top quality content will be surfaced to the top and significantly help reduce the number of places you need to go for your virtualization-related news. The other really neat thing about Stu's site is that there are no passwords to manage. When you sign up, an email with a login link is provided and everything is done using cookies. After you login, you will be able to view the current entries on the home page and if you wish to submit a link or a question, just click on the Submit button at the top. 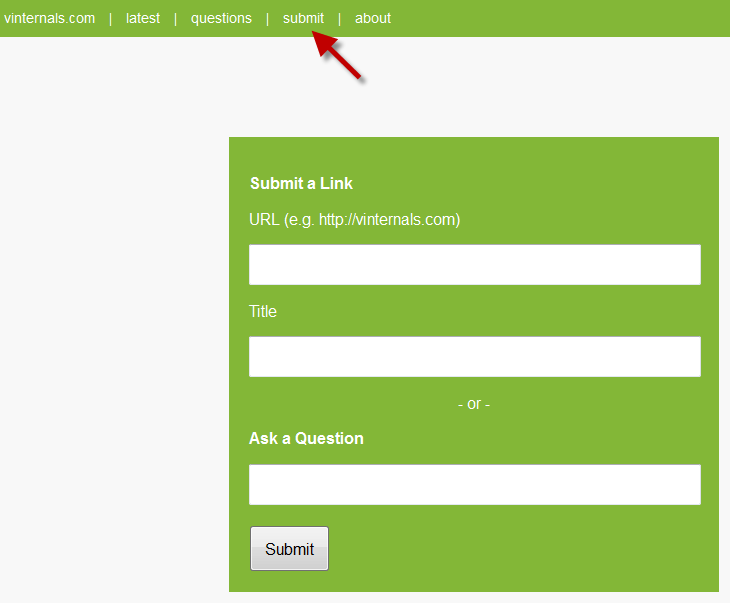 The input is pretty straight forward: A URL, title for a link or pose a question and click on submit. To vote for an entry, you just click on the green caret icon next to each entry. If you would like to learn more about the new the vinternals site and how it works, you can read about it here. If you are not signed up, what are you waiting for? Go here to sign up now! woohoo virtuallyGhetto is #25 on Top 25 VMware Bloggers!